Most kids including Nikolai, love chicken nuggets. I've previously sent chicken nuggets with him to be eaten at room temp, but he told me that he would prefer them warm. Therefore, I've to address a couple of things while packing nuggets for lunch; one is how to keep them warm till lunch time and another is how to keep them from getting soggy! We are thankful that we own both the Warmables Lunchbox Kit (find my review HERE) and a Warm & Tote lunchbag (find my review HERE) which allows us to pack hot lunches in some of our lunchboxes and the lunches remained warm till lunch time. 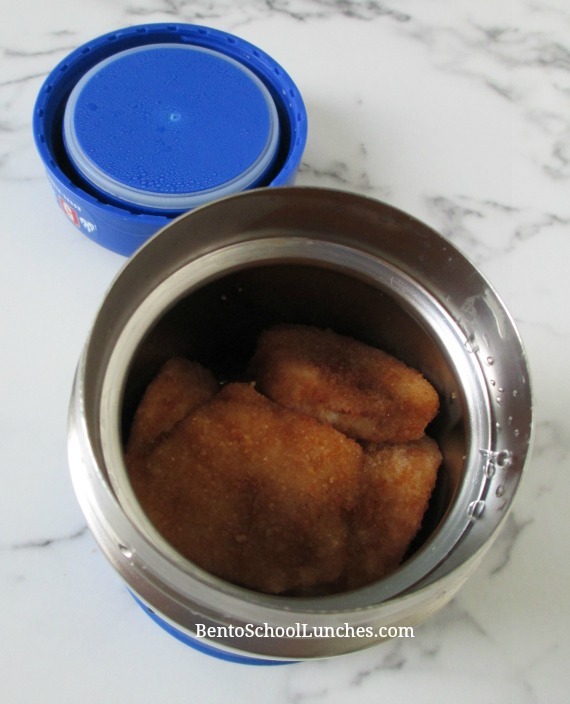 Let's talk about thermos...I've read the pros and cons about sending chicken nuggets in thermos, some mentioned that the nuggets were soggy and some said not! So, I very reluctantly tried the thermos idea. I followed some instructions which I read on other blogs, put them on a paper towel before you microwave them and also use a paper towel at the bottom of the thermos to absorb the moisture. I also had to boil some water, pour the hot water in the thermos, let it sit for a minute or so, dump the water out, quickly dry the inside of the thermos. Then only place the nuggets inside and close the lid. That is way too many steps for me, not to mention time consuming compared with using our Warmables set or the warm & tote lunchbag! 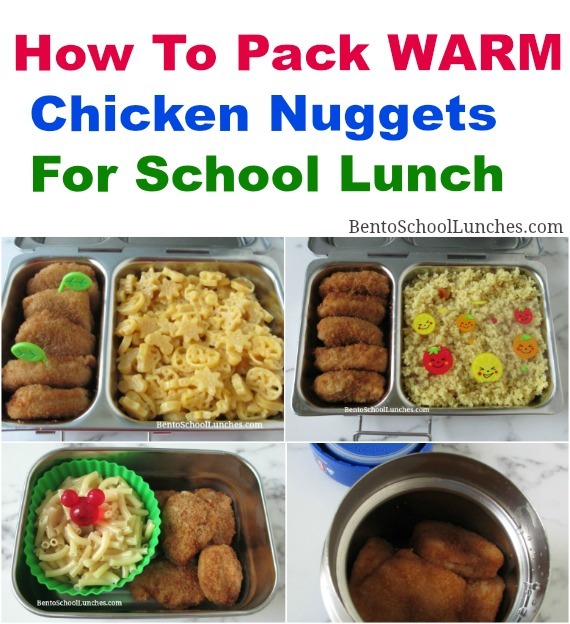 I don't mind packing mac & cheese, soups or stew in our thermos, these all worked fine, but according to Nikolai, the chicken nuggets were soggy and not quite appealing, he would rather eat room temperature nuggets than ones that are soggy. Here are a few lunches in which I packed chicken nuggets. 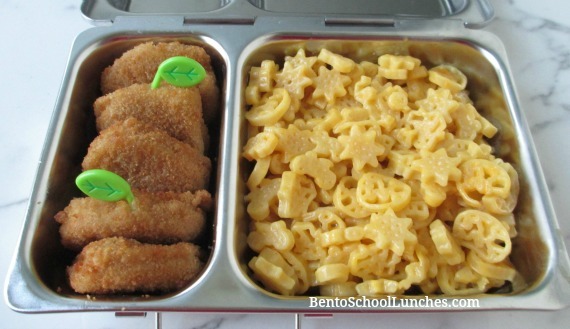 The ones packed in lunchboxes are also with mac & cheese or with couscous. I don't think that he would like the nuggets to be on top of mac & cheese as they would be if I were to use a thermos! I personally would not like that. He also had sides of fruits, veggies and snacks (ice pack included with these) which are not in picture. 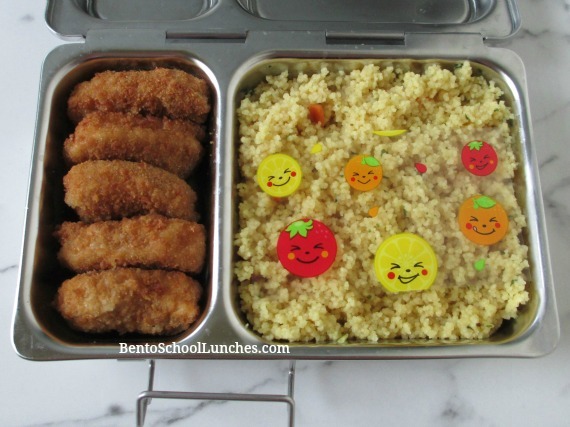 Bento lunch 1: All natural whole grain chicken nuggets, Parmesan couscous topped with a baran sheet. This lunch was packed in a Planetbox Shuttle. 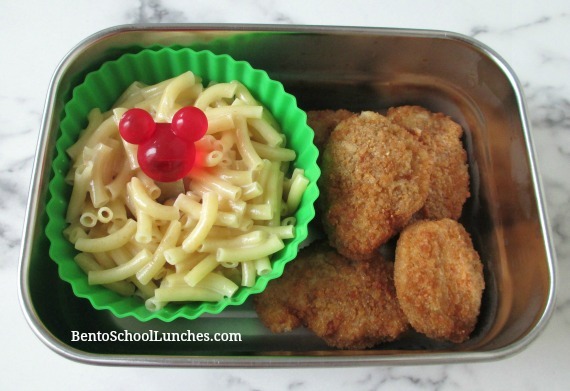 Bento lunch 2: All natural whole grain chicken nuggets with a couple of picks and Annie's organic pasta. This lunch was packed in a Planetbox Shuttle. Bento lunch 3: Annie's organic pasta in a large silicone cup with a Mickey pick and all natural whole grain chicken nuggets. This lunch was packed in our leak-proof blue water Ecolunchbox. Bento lunch 4: All natural whole grain chicken nuggets in a thermos and I had to quickly clean the water seen on the mouth of the jar before sending this with Nikolai. Do your kids love chicken nuggets? My older kid, I mean my husband, loves chicken nuggets as well, LOL. All the lunches look so so yummy! My boys and I love nuggets, they don't mind them at room temperature, but I've to say nuggets taste better when warm. Your nuggets look delicious! Now you've got me craving for some too!